I can’t get a handle on GPS. Being a moving blue dot on a screen just doesn’t do it for me. 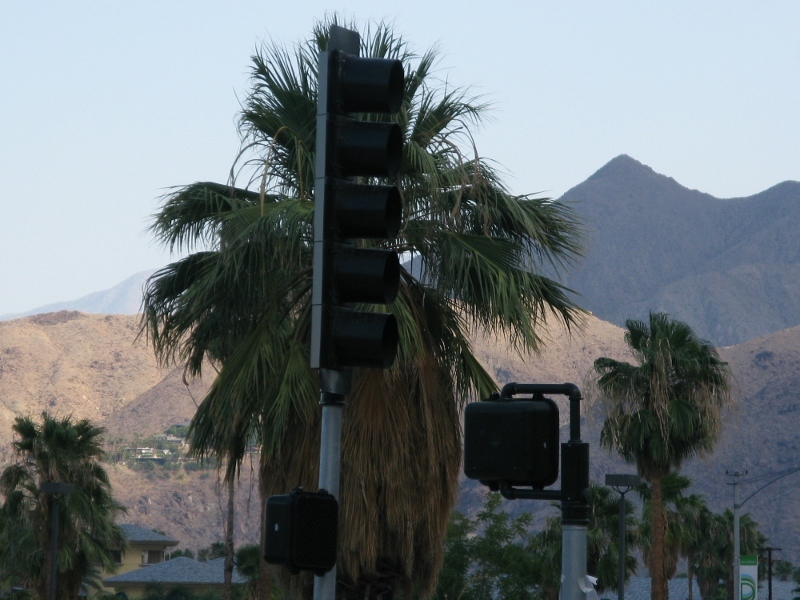 That annoying turn left, turn right, go straight is enough to drive me to distraction. 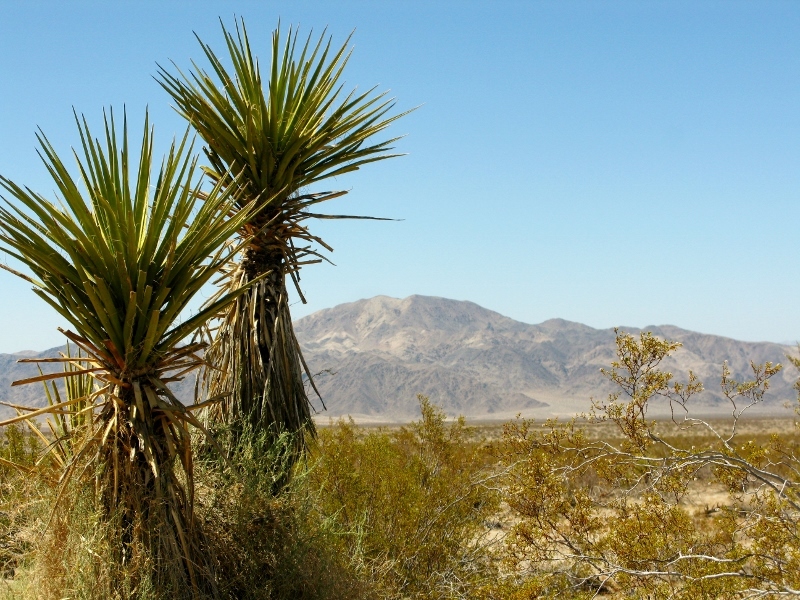 So we navigated our way across the Mojave desert using a hand-drawn map that spanned 200 miles. There were times I wondered if we’d taken a wrong turn but there had been no wrong turns to take. 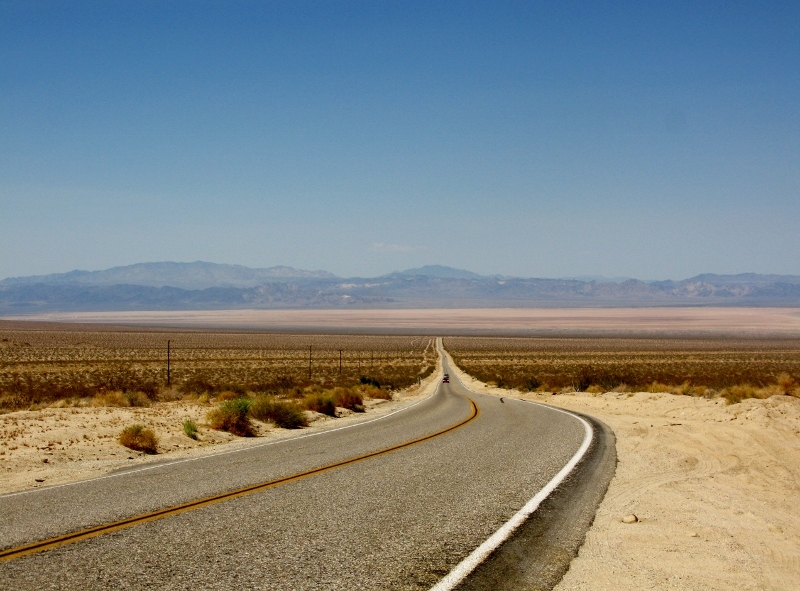 For miles and miles, all we could see was road, and desert. 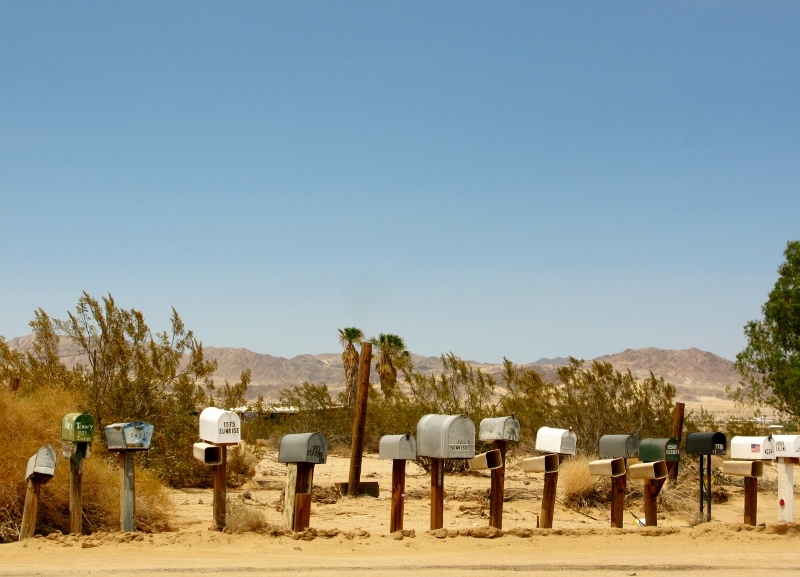 Lines of lonely mailboxes were clear indicators of the inhabitants and the houses that blended in so perfectly with their surrounds that they were invisible. We drove and drove and nothing much changed. And then we happened across Kelso Depot. Marked with an X on our map, it was somewhere to stop, to break the monotony. Once a boomtown, Kelso is now home to a renovated train station that houses a museum and a café – a café run by a chap called Mike who wants to sell out and retire, yet again. The 2013 version of this town is a far cry from the 1943 version when troops, tanks, and trucks were shipped through here by rail, creating a hive of activity that begot buildings, people, and commerce. All was well until 1985, when Union Pacific pulled out and the trains stopped pulling in. 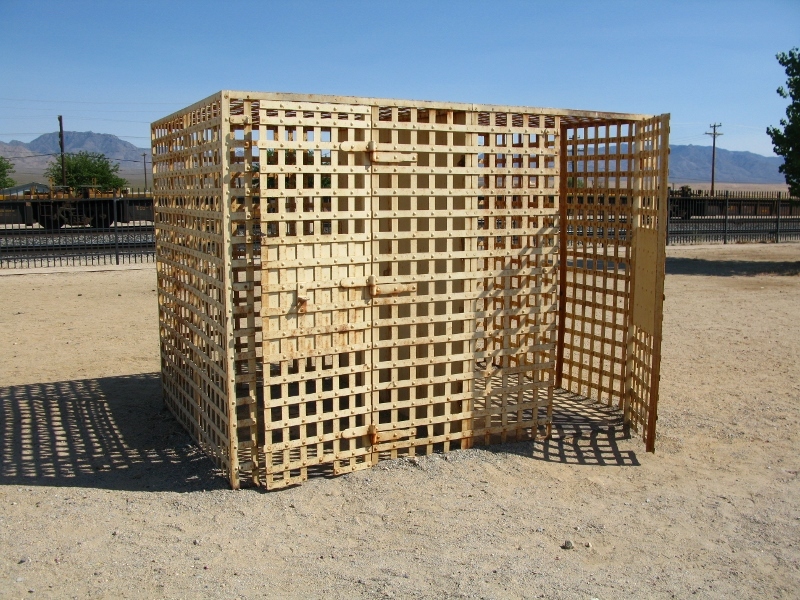 The old jail – a two-cell steel contraption – was used to house those who caused a ruckus after a few beers on a Friday night. Open to the elements, no one spent more than a night here – anything more would have been close to torture. 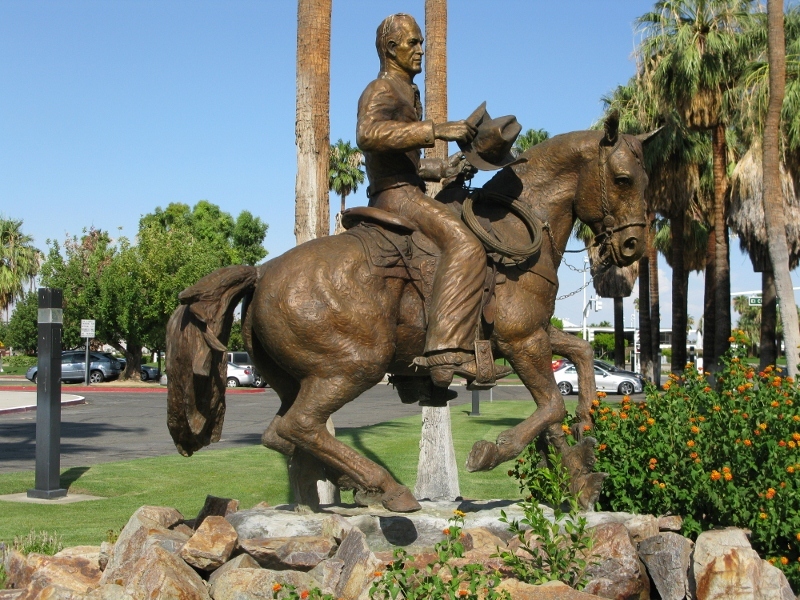 The town was called after a railroad worker who won a competition to have it named after him. 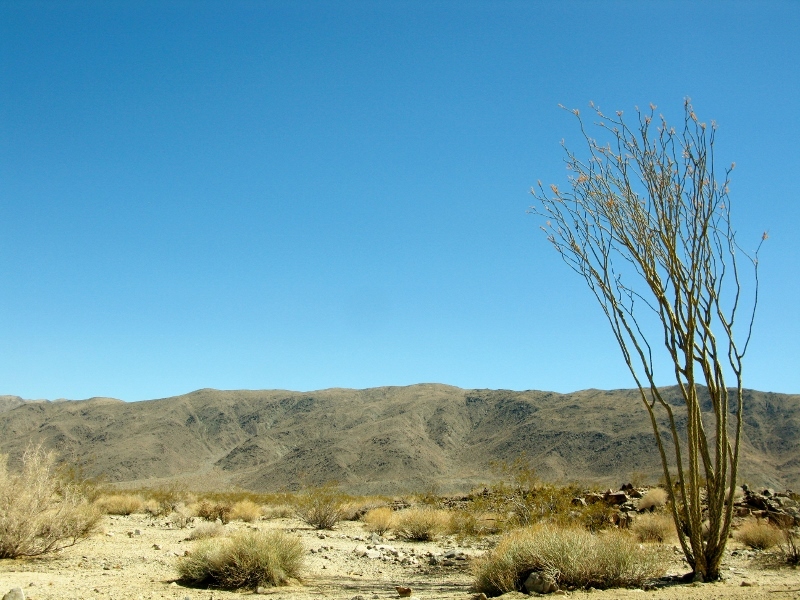 Its main claim to fame in the 1970s was that it was a town without television. 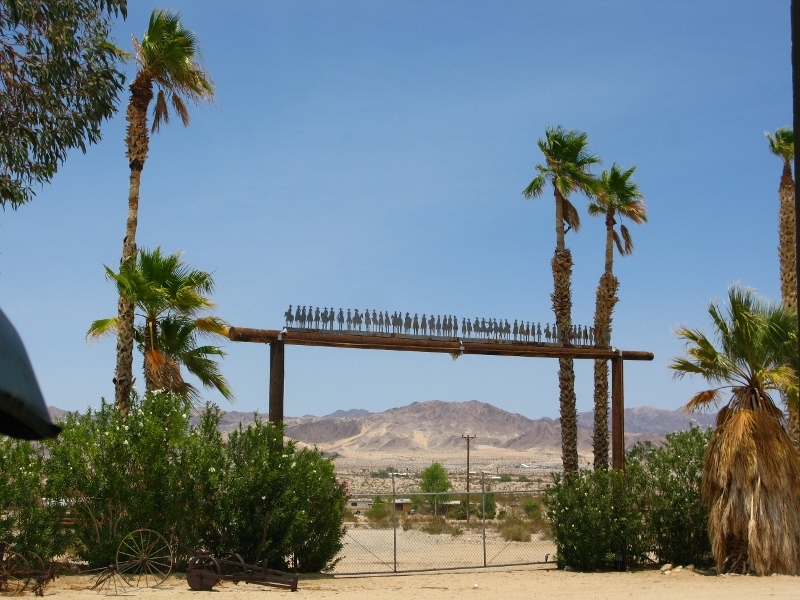 Now its main claim to fame is that it breaks the journey across the desert and offers root-beer floats to thirsty travellers. I’d forgotten what root beer tasted like. But the concept of a root beer float (vanilla ice-cream floating in a glass of soda) was too all-American to pass up. 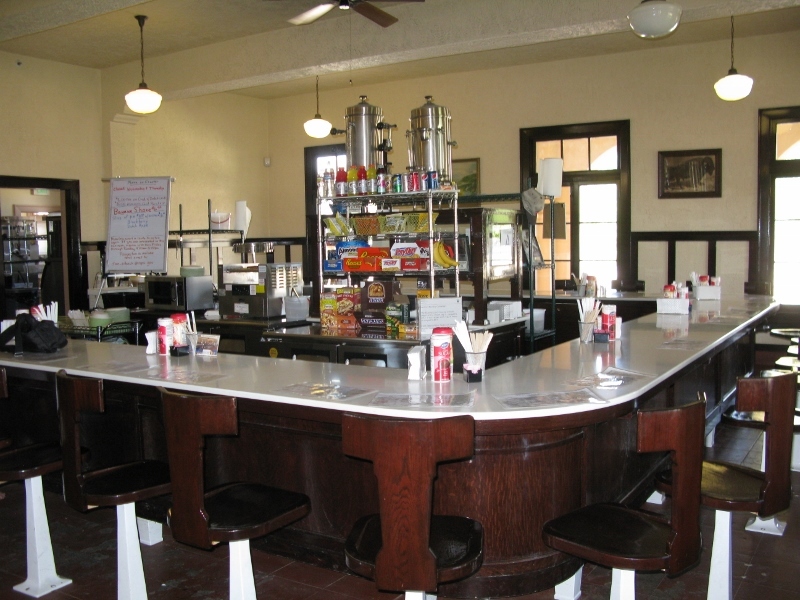 And the decor, with its bar counter and high stools, looked as if it had come off a TV set for a 1960s American sitcom. So we tried them. And didn’t like them. But struggled through. If you’re wondering what root beer tastes like, it’s remarkably similar to that horrible eucalyptus toothpaste – the pink stuff. Bless him though, Mike didn’t want to take our money. But traffic was light that day so we compromised and paid just $5 for the experience. America isn’t just big cities, skyscrapers, and football stadiums. At its backbone are people like Mike, ordinary people, trying to eke a living from the cards they’ve been dealt. America is more attitude than atmosphere. That instant familiarity can take a little getting used to but then you stop for sustenance in the boonies and spend a pleasant half hour talking about nothing with someone you know you’ll never see again. And that someone, that stranger, does something nice – like buy you a root-beer float – then you get it. However superficial it might seem, America has an abiding interest in other people’s business, a curiosity about the world outside, and a opinion on just about everything. And when you strip away the commercialism, the bright lights, the designer labels, and stumble across places like the Beanery, and see small-town America for what it is, the kindness comes out. Someone commented once that all too often we are so preoccupied with the destination that we forget to enjoy the journey. We’re so focused on getting from A to B that we don’t see what’s around us. I’ve been arguing for years that life plans don’t suit me – I’m too afraid that I’d miss myriad opportunities were I to focus on one end goal. 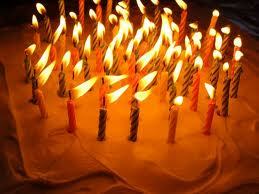 Granted, I have had one plan in life – when I was 17. I was going to be a teacher, marry a teacher, have two kids (boy and a girl, Tadhg and Maud) by the age of 27, and be ready to retire and travel by the age of 50. When I read that back, I see that my grand plan comprises a number of separate plans, not one of which has materialised. I failed from the outset because I didn’t get into Teacher Training College. I fell at the first hurdle. Never made the first milestone on my Gantt chart. Once I’d gotten over that disappointment (and it was a big one), I resolved that, in future, my plan would simply be to have no plan. And it’s worked – so far. When I travel, I might have a destination in mind, but I’m permanently on the look-out for some place interesting to stop along the way. 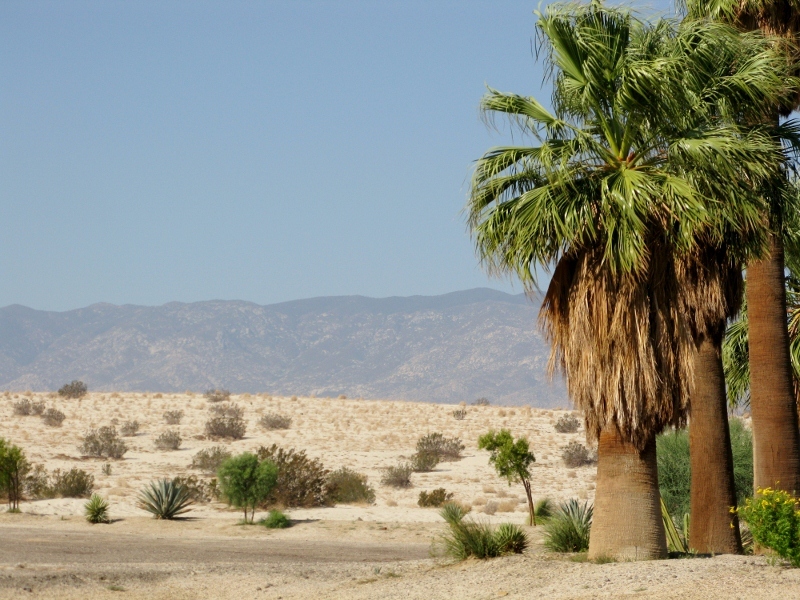 The city of Twentynine Palms in California is notable for three reasons. 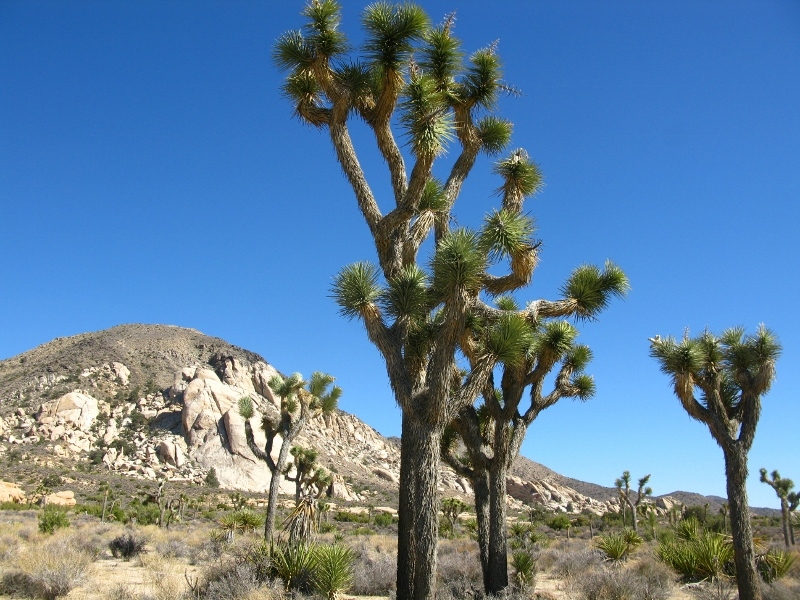 It’s home to the HQ of the Joshua Tree National Park. It’s home to the 932-square-mile Marine Air Ground Task Force Training Command – the largest Marine Corps training base in the world. And it’s home to my mate AP’s brother. 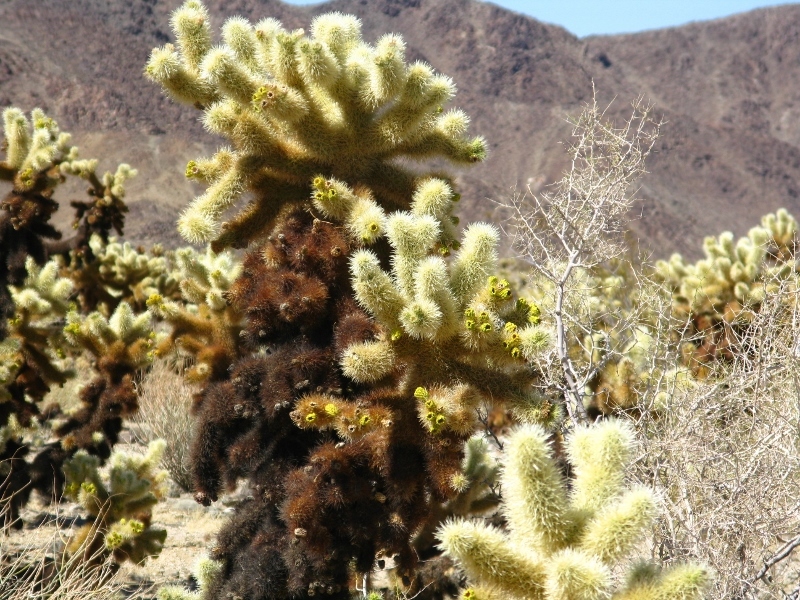 The plan was to meet A&R for lunch and then head across the Mojave desert on the four-hour drive to Las Vegas. I was expecting a catch-up and a good lunch. I got both. What I wasn’t expecting was to find the MAGTFTC and its 10 000 + military residents. I was fascinated and found myself talking in a rapid-fire parody of an AK47. Who? Why? Where? When? 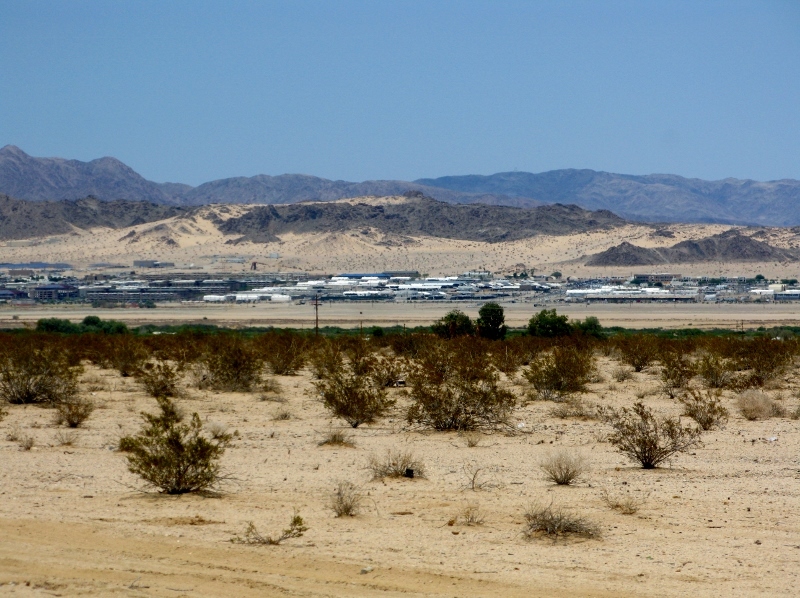 So I read up on it a little and discovered that this place in Twentynine Palms provides training for any size unit from individual to regiment, for any warfighting discipline from infantry to logistics, and from all parts of the combat spectrum from full scale war to establishing local governance. And I found myself thinking how I’d like it if all that was going on in my back yard. 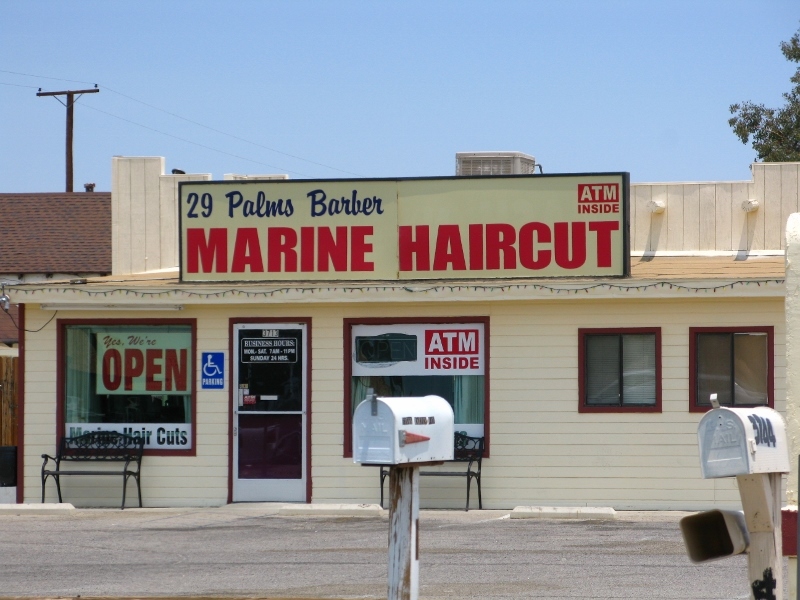 But then I remembered the 6000 or so locals employed in civilian capacity on the base and figured that the US Marine Corps is just like another huge corporation … and Twentynine Palms is, in effect, a company town. Now, I’m a peace-loving gal at heart. The closest I get to war is reading about it. My opinions on the subject can’t be boxed with any regimental accuracy. Yes, it fascinates me. In my darker hours, I see it as a great evolutionary joke – we used to send our best and brightest way to fight our great wars and what was left behind added to the gene pool. I’ve written recently about the USA and its outward display of respect and appreciation for its troops and while the individual should be applauded rather than maligned for fighting for their country, those in charge occasionally leave some doubt in my mind as to their credentials. The closest I’ve come to the US Military scene is a friendship with a couple of Coasties in Alaska, a date or three with a Army reservist in LA, and a quick conversation with a retired Marine here in BP some months back. Other American and Australian friends have sons, daughters, nephews, nieces, brothers, sisters, husbands, wives, and parents in the service and I know that this blood tie gives them a different perspective, one I can never appreciate fully. I am curious though – so curious – about a living a life that has unquestioned obedience at its core. To my mind, with that obedience has to come an irrefutable trust in those higher up the command chain – trust that they’re making the right decisions for the right reasons in the best interests of all concerned. In what some might seem a little strange, I have no problem believing in God but I simply cannot get my head around blind trust from a military perspective. The invocation ‘following orders’ brings me out in a cold sweat. 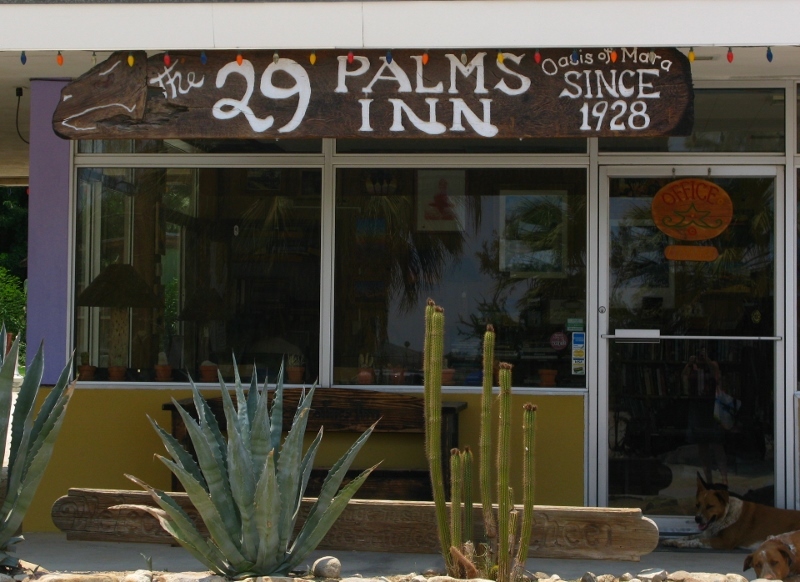 Twentynine Palms was simply a stop along the way – but it now has me questioning so much. As Henry Miller said: One’s destination is never a place, but a new way of seeing things. Let the journey continue. I had a birthday last week. Another one. They seem to come around with increasing regularity. But as I’m firmly stuck on 36, they’ve long since lost their hold on me. Gone are the days when I’d spend the weeks leading up to my birthday contemplating all I didn’t do that year, berating myself for not being more… well… something, and bemoaning the fact that I was one year closer to maturity without the associated trappings: house, car, husband, kids. These days, it’s more about chalking one up to success. A retrospective of this last year gets an 8/10 from my inner jury. On the plus side, I’ve travelled, been involved in interesting work projects, met some fascinating people, read some great books, discovered new corners of Budapest. I’ve entertained and been entertained. I’ve laughed more than I’ve cried. And I’ve finally put handles on my doors. On the minus side, I’ve put on a few pounds, been scammed, not been too healthy, and lost a very dear friend. 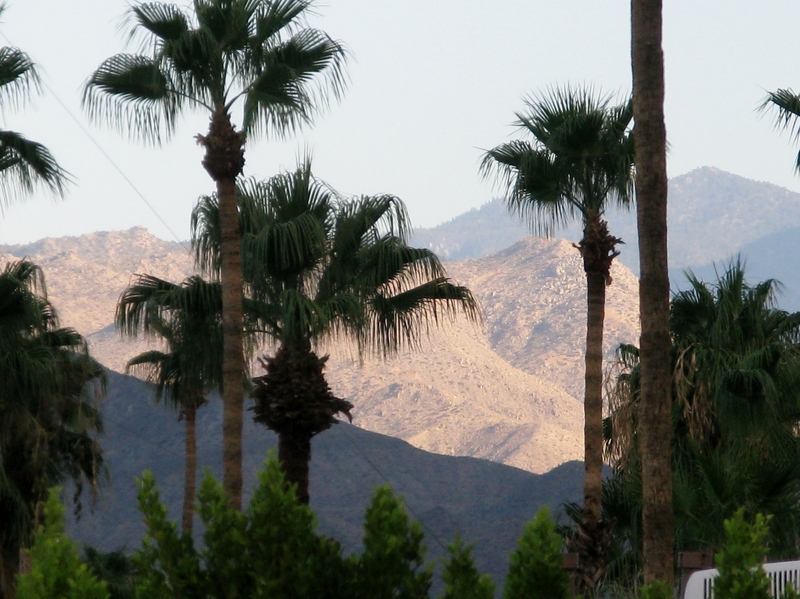 This year, I was in Palm Springs on my birthday with the lovely DL-W and VB. We’re three Chinese horses – not quite three generations but close enough. On the actual day, I gave a talk at D’s church. Another retrospective – this time of travel and tolerance. 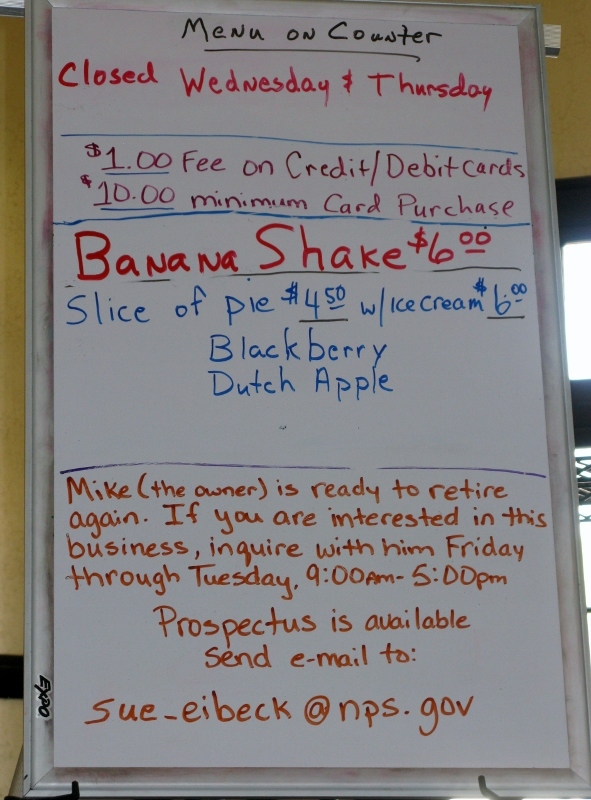 The community was open, friendly, and very welcoming. The discussion afterwards was insightful and thought-provoking. It gave me hope. Hope that we might actually learn to live with one another, without judging. This week, I’m grateful for shared experiences, for having the chance to travel, and for having opportunities to meet new people. I’m grateful for simply being alive. 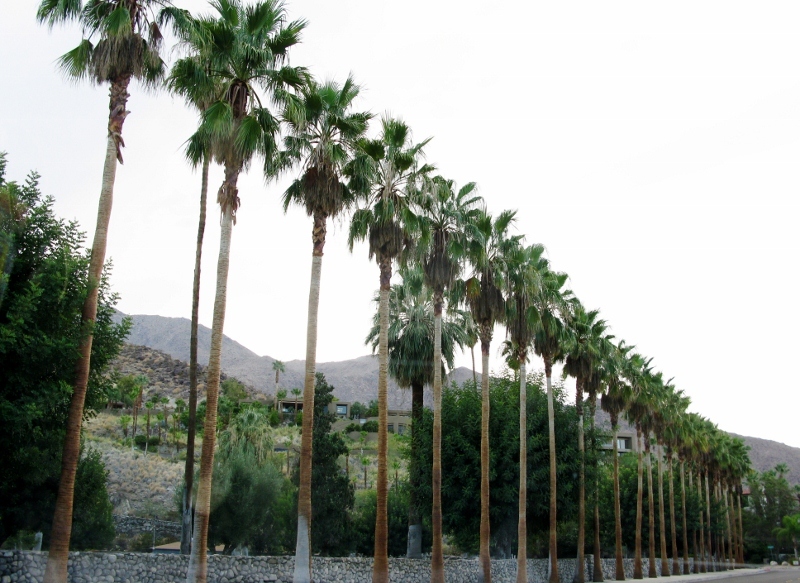 Palm Springs, California. 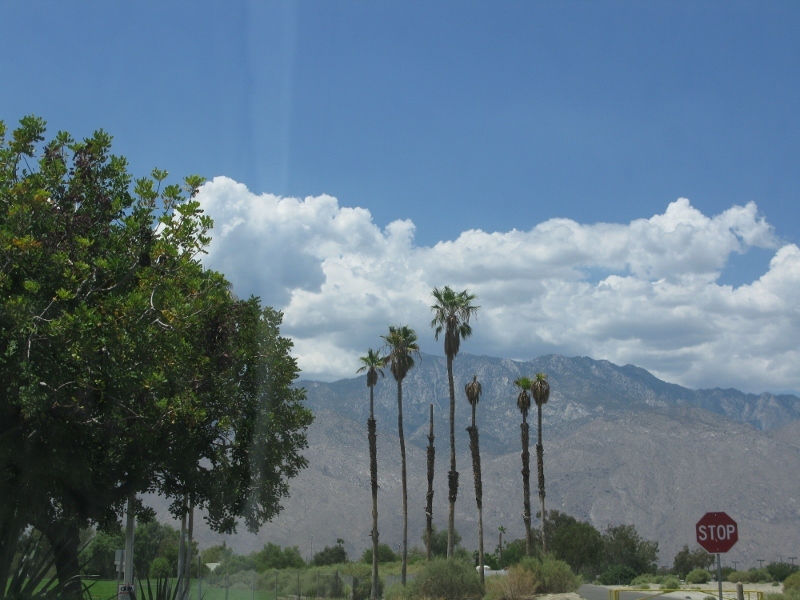 Flat land surrounded by the San-Bernardino and the San Jacinto mountains that seem to rise up out of the ground. It’s hot. Bloody hot: 46 degrees in the shade (116 F). 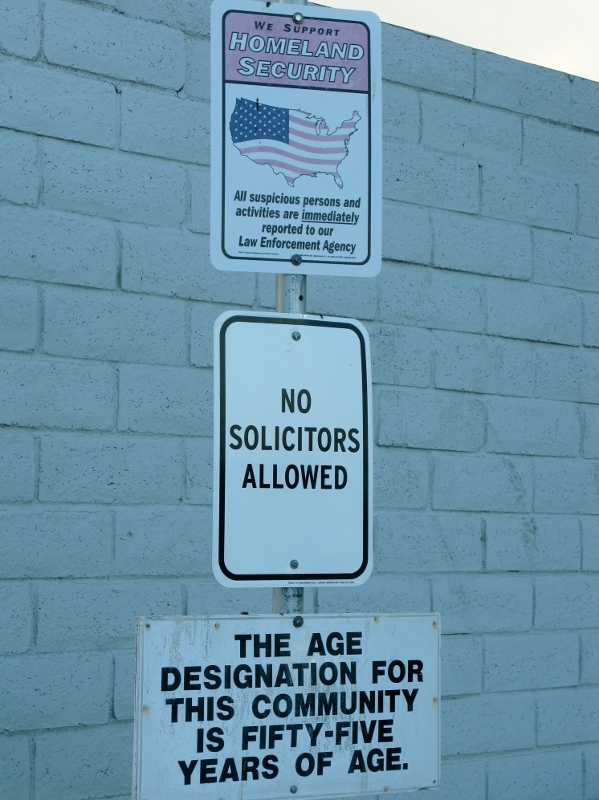 Posted signs give you an idea of how old the population is and yet when driving around, I didn’t spot any cemeteries. It took a while to reason why. There are no headstones. The only thing that gives it away is the wall surrounding a seemingly empty field. 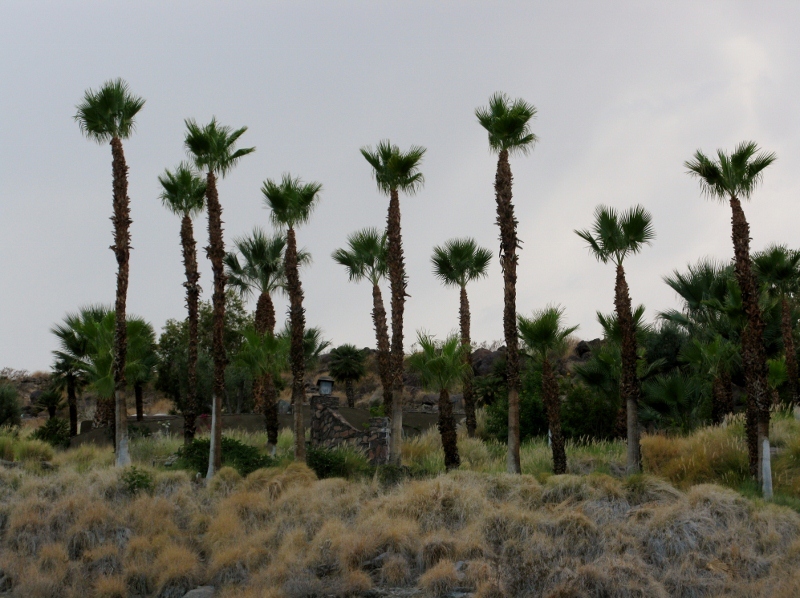 We came across the Wellwood Murray cemetery, built for the first white settlers in Palm Springs. Wellwood Murray Jnr was the first to occupy this small plot of land in 1894. Once in there, his parents allowed other white settlers to be buried alongside him and in 1914 WM Snr , the pioneer hotelier, was laid to rest. 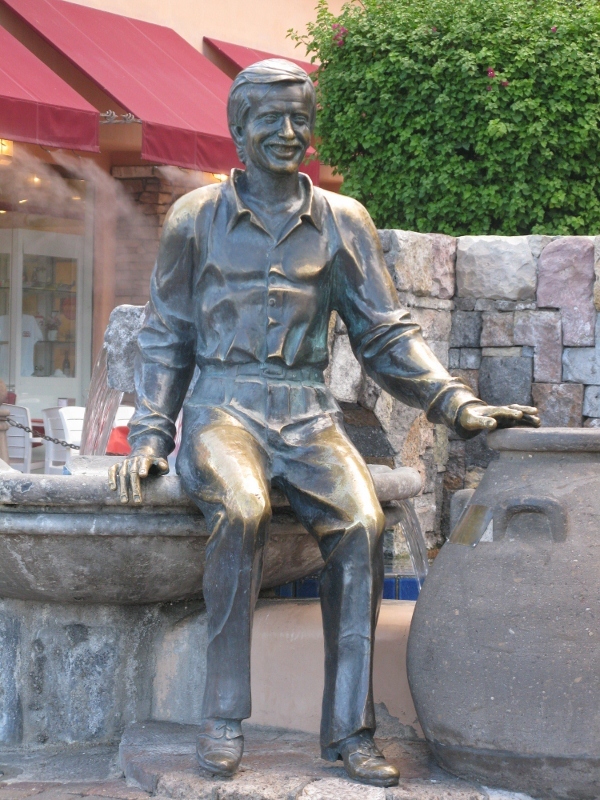 He had opened the first hotel in the area, the Palm Springs Hotel, and set the town on the road to fame and fortune. 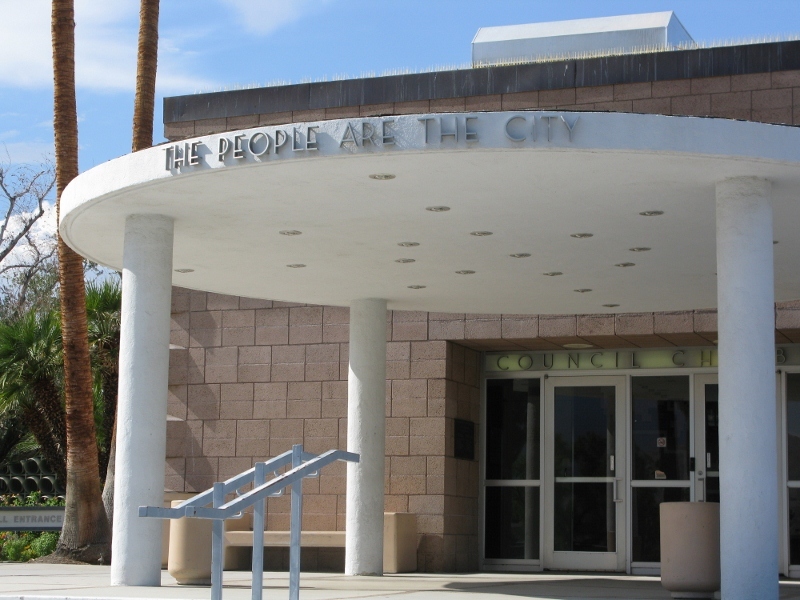 A ribbon of towns wends its way through Coachella Valley: Palm Springs, Cathedral City, Rancho Mirage, Palm Desert, Indian Wells, Bermuda Dunes, La Quinta, Indio, Coachella, Thermal and Mecca with barely a discernable difference visible to the novice eye. 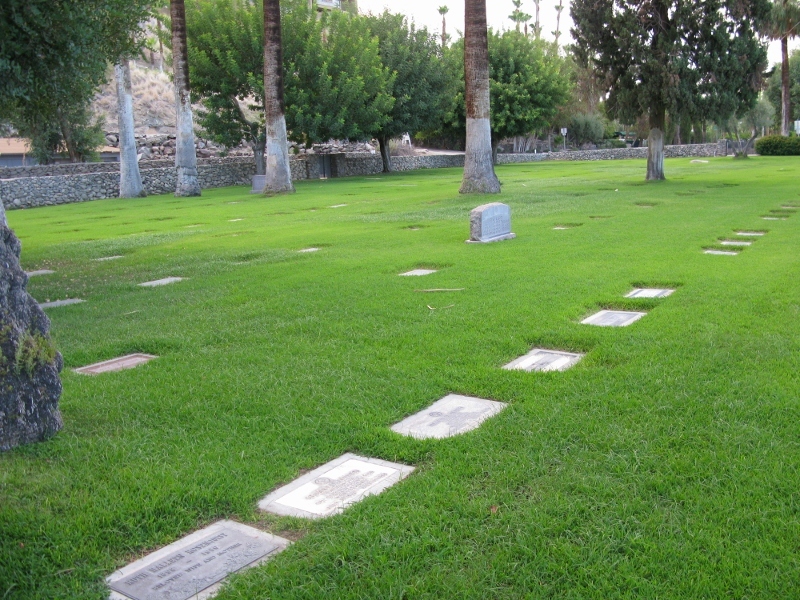 Over in Cathedral City, on Ramon Road lies Desert Memorial Park, another quiet cemetery with nare a headstone in sight. 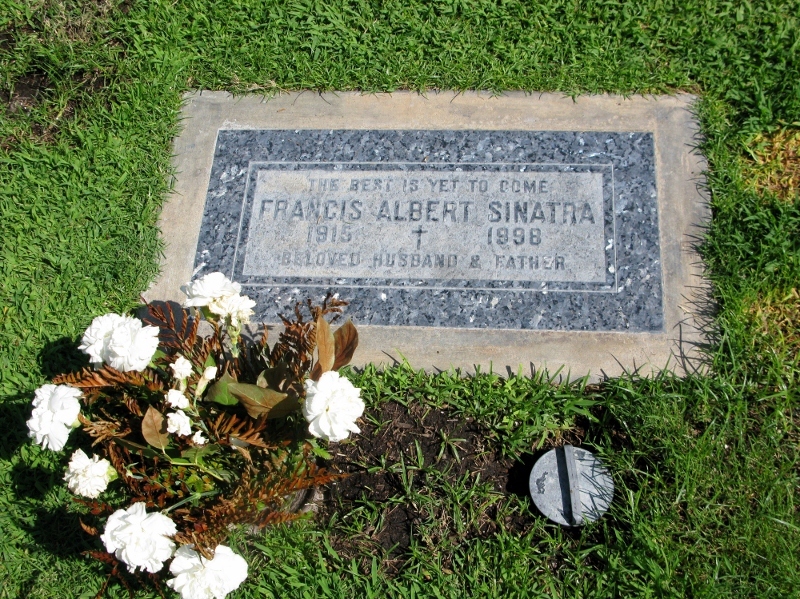 Home to the some more famous internments (as the guiding map so eloquently puts it), I stood for a while over Frank Sinatra’s grave. Once, in London, waiting for afternoon tea in the Ritz, I sat near the pianist. He asked if I’d like him to play something for me. I asked if he new any Sinatra. Knew him? He’d played with the man himself in South America. He asked what I’d like him to play. I told him to choose. He started playingI’ve got you under my skin. Some weeks later, I was in a pub near Waterloo. The owner, a karaoke-loving freemason, told me he’d sing me a song. What would I like? I asked if he knew any Sinatra. He said he knew just the song for me. And yes, he started in on I’ve got you under my skin. Coincidence is God’s way of remaining anonymous – and while I have no idea what He was trying to say to me, this song remains a favourite. Cemeteries and prisons. Two things that I’m strangely fascinated with. And as prisons go, Alcatraz is one of the most iconic. Standing on this side of the water, looking out across San Francisco Bay, it’s easy to imagine the desolation of life on the rock. 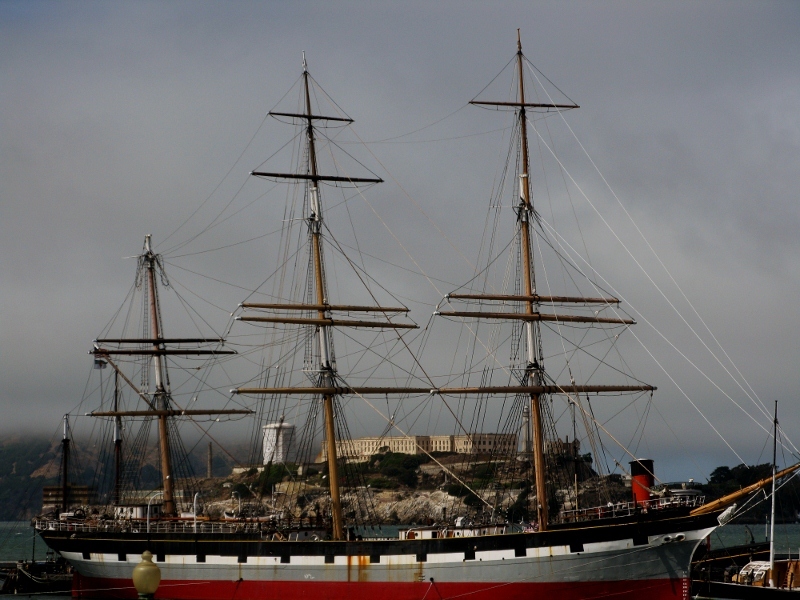 Back in 1775, Spaniard Juan Manuel de Ayala charted San Francisco Bay and named the island La Isla de los Alcatraces, which translates as the island of the pelicans. 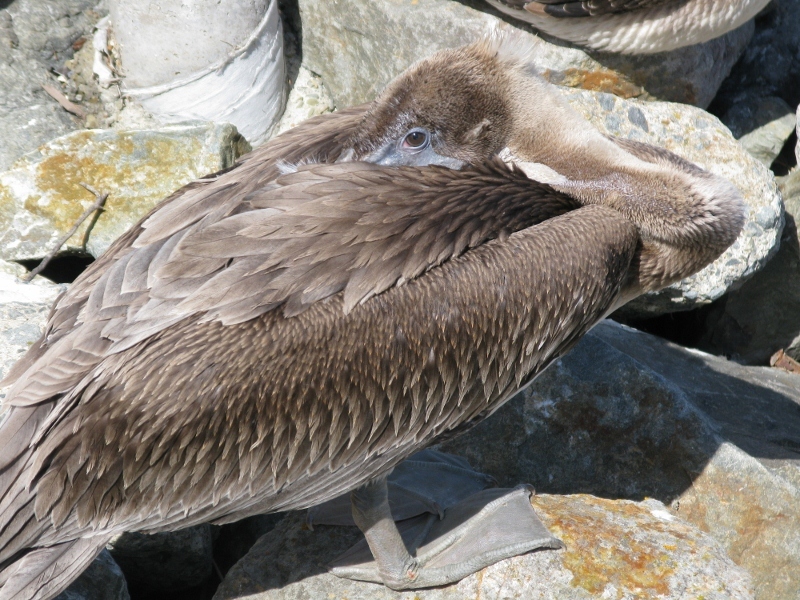 Alcatraz is the old Spanish name for pelicans, a word the Spanish borrowed from the Arabic القطرس al-qaṭrās, or sea eagle. It started out as a military prison and for 30 years (1933 to 1963) served the country as a federal prison. 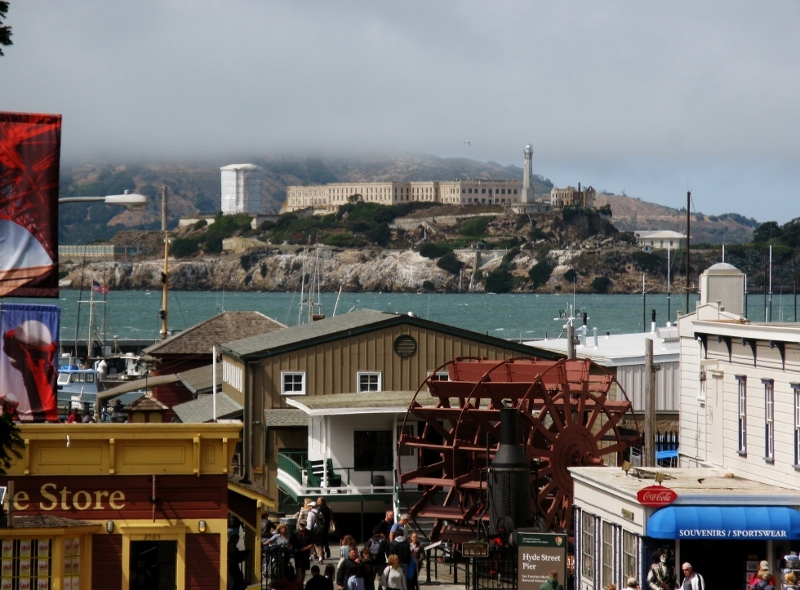 Although it’s been years since I was there, I can still remember sitting in a cell and thinking what life must have been like marooned on the rock with the bustling city of San Francisco visible just 1.5 miles across the Bay. So near and yet so very, very far. 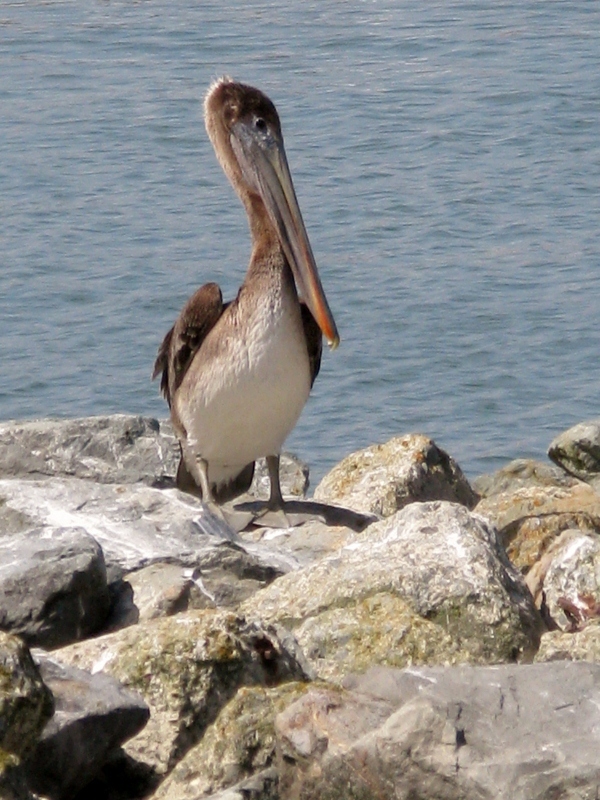 In stark contrast, standing sentry, are squadrons of pelicans. 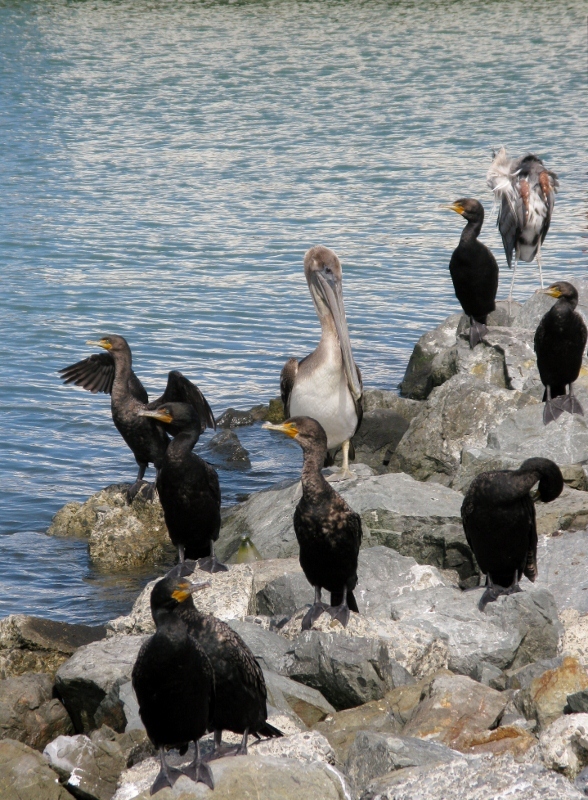 Perched down by Pier 33, they watch as the tourists board the ferry to take them to the island. I was struck by their watchfulness. Reminded again of my cab driver who shared with me the privilege of noticing the unnoticed, I wondered at how much and how little some of us see. 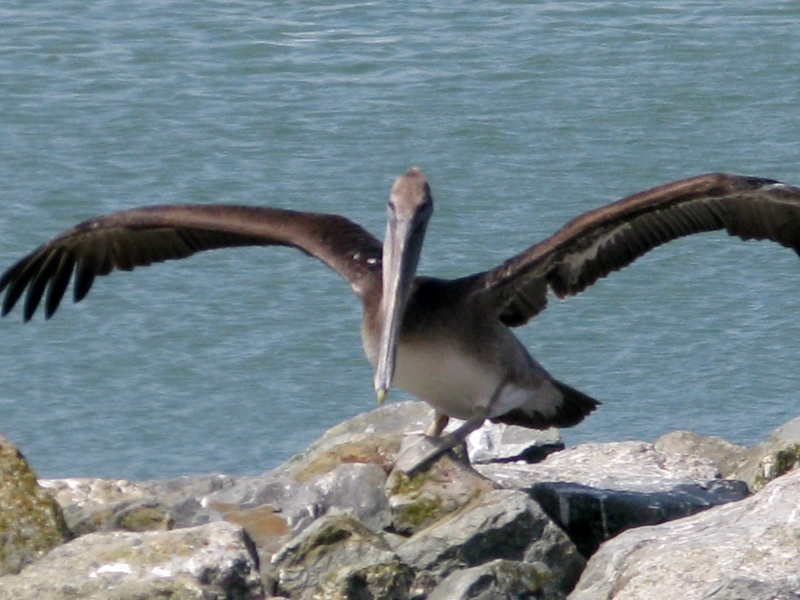 Some species of pelican can grow to 70 inches and can have a wing span as wide as 10 feet. The chubby ones can weigh as much as 30 lbs. Big birds indeed. Using their elastic throat as a dip net, they catch fish and swallow immediately. 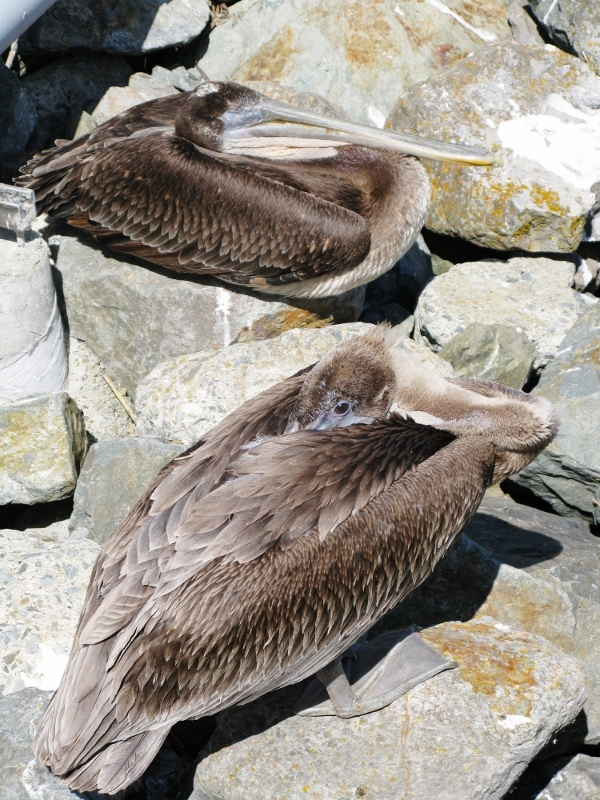 The brown pelicans, the ones in San Francisco, get their fist by plunging from the air but others swim in formation and drive the fish into shallow waters – perhaps this is why they’re collectively known as a squadron. Strangely fascinated by their graceful lethargy, I could have spent hours watching them. But I was on a mission. I’d come down to the Wharf in search of a Russian wedding ring. And I found one. And the little toothless Asian woman who sold it to me saw me coming. ‘Silver’, she said. ‘Will bring you luck. Fifty dollah. Plus five dollah sales tax.’ A little taken aback at the price, I tried in vain to see if it was stamped but I had the wrong glasses with me. Turns out it wasn’t. But I was a day late and a dollar short. I can only hope that her karma is in good working order.